Local koi pond and water garden clubs are the first ripple in getting to know your pond keeping community. Koi pond and water garden clubs are an invaluable resource for information on fish, plants, and how to manage your pond. Pond clubs are also a very fun outlet into the lifestyle of pond keeping. I recently had the opportunity and pleasure to speak with a couple of koi pond water garden clubs. In late Winter 2016 I made a trek up to Rochester, NY to speak with 2 of the areas koi pond and water garden clubs. Kicking off under October’s full Hunter’s Moon, a virtual tribe of pond professionals gathered for Shindemonium 2014 which took place October 8-10 in the Maryland countryside; with 3 perfect days of Autumn weather. 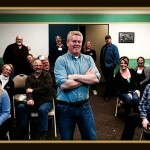 Also an amazing 3 days of networking and learning for pond professionals and business owners. 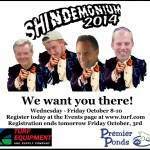 Hosted by Premier Ponds and Turf Equipment, Shindemonium is a growing industry event for pond pros interested in making their business operations more efficient, with better customer service, while gaining higher profits.